Eardisland is a picturesque village in North Herefordshire, set on the banks of the River Arrow. The Community Website provides information for residents and visitors. We hope you will find it useful. 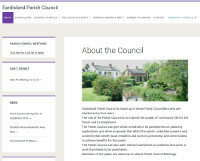 To be kept up to date on Parish news, events and offers please sign up at the bottom of the page.